HANGZHOU, China, September 6, 2016 (ENS) – On Saturday, ahead of the G20 meeting in Hangzhou, the United States and China deposited with UN Secretary-General Ban Ki-moon their respective instruments to join the Paris Climate Agreement, agreed last December by 195 countries. For the agreement to take effect and enter into force, at least 55 countries representing at least 55 percent of global emissions need to formally join the agreement. Together, the United States and China represent about 40 percent of global greenhouse gas emissions. The action by the United States and China moves the agreement towards entry into force this year with countries representing more than 40 percent of global emissions having now joined and more than 55 countries having already joined or publicly committed to work towards joining the agreement this year. “This Summit has witnessed major steps forward on climate change,” said UN Secretary General Ban Ki-moon, commending the leaders of China and the United States for officially joining the Paris climate accord by depositing their legal documents with him. Legal processes must be concluded in parallel with a renewed commitment by all the countries to honor their pledges. With the world’s two largest greenhouse gas emitters making this historic step, 26 parties to the Paris Agreement and 39 percent of global greenhouse emissions have been accounted for. Another 29 countries and 16 percent more of global emissions will bring the convention into force, Ban explained. “I am hopeful and optimistic that we can do it before the end of this year and before my term as Secretary-General of the United Nations ends,” he said. The UN chief will convene a special event on September 21 at UN Headquarters in New York for the deposit of instruments of ratification, acceptance, approval or accession to the Paris Agreement on Climate Change. The event will provide an opportunity to other countries to publicly commit to the agreement before the end of 2016. “In that regard, the actions taken by early ‘ratifiers’ like China and the United States – those are the two biggest emitters – are far-reaching, visionary. They are working for the people, they are working for planet Earth,” Ban said. China’s legislature on Saturday ratified the Paris Agreement on Climate Change. Lawmakers voted to adopt “the proposal to review and ratify the Paris Agreement,” at the closing meeting of the bimonthly session of the National People’s Congress Standing Committee. “Someday we may see this as the moment that we finally decided to save our planet,” said the U.S. president. “There are no shortage of cynics who thought the agreement would not happen. But they missed two big things: The investments that we made to allow for incredible innovation in clean energy, and the strong, principled diplomacy over the course of years that we were able to see pay off in the Paris Agreement. The United States and China were central to that effort. Over the past few years, our joint leadership on climate has been one of the most significant drivers of global action,” said Obama. 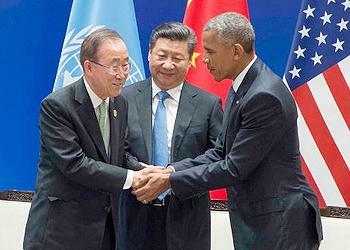 Obama traced the history of the U.S.-China effort to protect the planet from climate change. French President Francois Hollande on his Facebook account hailed the joint move, while UN climate chief Patricia Espinosa said in a statement that it opens up an avenue for the world’s sustainable development.